The CV Recorder 57A module provides a radical new approach to generating modulation and voltage control signals. 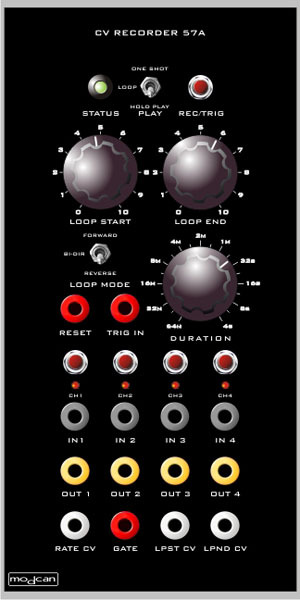 The implications for this module are extensive when placed in a modular synthesizer context. Concept: Combine the ability to record and playback control voltage signal events from standard modules with the tools to shape, mix, loop and time scale these performances in a simple and repeatable manner. Record envelope shapes and loop them while adjusting the loop start and end points. Perform granular synthesis type effects on CVs using short loops and sweeping the loop points through the sample under voltage control. Record lo-fi audio samples and shift playback frequency in real-time. Chain multiple samples by recording with different loop points and sample rates. Channel LEDs indicate arming of channels for recording. Recorded, using the VC Sequencer 54B into the Quantizer 55B. The voltage steps for the VCDO pitch and FM index and sequencer pulse out were recorded and looped by the CV Recorder. The sliders on the sequencer were tweaked and recorded with each successive pass creating a recognizable pattern but with more variation. The sound component is VCDO, Super Delay and 4VCA with DADSR.